The share of Latinos who rate their personal finances as “excellent” or “good” has nearly doubled since the Great Recession, and this growing optimism extends across nearly all Latino demographic subgroups. However, half of Latinos say their family income is not keeping up with the cost of living. Overall four-in-ten Hispanics say their personal financial situation is in “excellent” (8%) or “good” (33%) shape, according to the latest Pew Research Center National Survey of Latinos. Still, a substantial majority (59%) describe their financial condition as “only fair” (47%) or “poor” (12%). The latest results contrast sharply with those in November 2008, in the midst of the Great Recession, when only 4% of Latinos reported that they were in excellent financial shape and 19% said their financial condition was good. At the other end of the financial spectrum, 30% rated their financial condition as poor in 2008 – more than double the share expressing that view in the latest survey. The gap has closed significantly since 2008 when the difference between Latinos and the public stood at 18 percentage points (41% for all Americans and 23% of Latinos), roughly the same-sized gap as in earlier years. Looking back to before the recession reveals another striking difference between Hispanic economic perceptions and those of the U.S. population as a whole. Latino views of their financial situation are more positive now than they were in 2004, when roughly a third (31%) rated their financial condition as excellent or good. By contrast, the public’s view of its finances is lower now than in 2004, when about half (51%) had a positive view. An analysis of 2008 and 2015 survey data finds that Latino perceptions of their economic well-being have increased among most major Latino demographic subgroups. Younger Hispanic adults tended to have bigger gains than older Hispanics. About half (48%) of Latinos ages 18 to 29 report that they were in excellent or good financial shape in 2015, a 27 percentage point increase from 2008 and more than double the share who had a similarly positive view of their finances that year. By contrast, gains in perceptions of economic well-being among Latinos 65 years old or older were more modest, standing at 37% in 2015. These differences by age are the exception, not the rule, as similar-sized gains are recorded among most other demographic subgroups. For example, ratings of personal finances rose by 17 percentage points among U.S.-born Hispanics and by 18 points among those born in another country. Positive views of economic well-being rose by 16 percentage points among Latino men and by 18 points among Latina women. These rosy assessments also increased by double digits among those with less than a high school education (+12 points) and high school graduates (+16) as well as those who had attended college (+17). Two other Pew Research Center surveys of U.S. adults conducted in 2014 and 2015 show that many Hispanics say their family income is falling behind the cost of living. In 2015, about half (53%) of Latinos said their family income is not keeping up with the cost of living. Meanwhile, 37% said their income is staying about even with the cost of living, and 10% said it is going up faster than the cost of living. In 2015, blacks and whites held similar views as Hispanics on this issue. 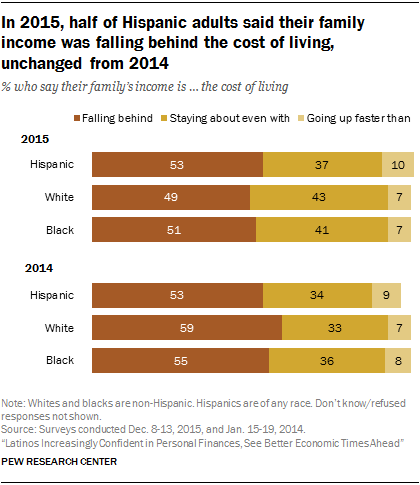 Between 2014 and 2015, Hispanic views of family income in relation to the cost of living were unchanged—about half of all Hispanic adults in both years said they were falling behind financially, as was true for the U.S. public as a whole. By contrast, whites reported some improvement in their family income relative to the cost of living across the one-year time period. As a result, overall in 2015, the three racial and ethnic groups looked fairly similar on this measure.